Words cannot express what Smile-A-Mile means to our family! After diagnosis in November of 2013, we pretty much lived in the hospital. The Hospital Outreach Program was a blessing to us, as it gave Austin something to do besides sit and look out the window at airplanes. Meeting the SAM family in the hospital was a blessing in itself. The way that they interact with patients and siblings truly makes your days go by quicker while being on the floor. It allows us, the parents, time to forget about what our children are fighting. We were unable to attend camp the first year of diagnosis, because of being in and out of the hospital so much, but during our second year of treatment, Kellie and Madison pretty much begged us to come to camp. Emily and I discussed it and decided we would step out of our comfort zone and go. Because it is a long drive for us to camp, it gave us time to discuss it….and we almost turned around…even when we were pulling into the drive at camp. We were a little unsure of letting Austin and Aspen out of our sight, with someone we didn’t know. 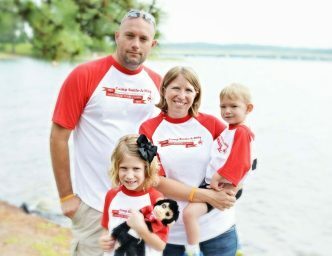 It was scary because our son has Leukemia. Within the first five minutes of arriving, Austin and Aspen were gone with their counselors and we only saw them at meal time and bedtime. It gave Emily and I time to breathe! We are so blessed to be a part of the SAM family.